Just because you’re studying doesn’t necessarily mean you’re learning. When it comes to finals and the bar exam, sometimes reading over law concepts just isn’t effective enough, especially when there’s so much information to cover. You may find yourself simply memorizing concepts when what you really need is to be learning them. Learning requires both in-depth understanding and engagement with your study material, but not everyone learns information the same way. That’s why determining how you learn best can be the greatest indicator of how you can increase productivity and study more efficiently for any exam. Click on this link to determine your learning style – visual, auditory, or kinesthetic (tactile) – in less than 5 minutes. Then, read the law-specific study tips below that match up with your results. You learn best through seeing and watching others. Reading and writing are two of your academic strengths, and you get distracted easily in class by movements in windows, doorways, and others around you. You work well in libraries and similar quiet spaces, and you would be more likely to remember the slides of a PowerPoint presentation that you saw in class than the words of the presenter. Take detailed notes as you study. Fill them with bullet points, charts, diagrams, and any visual image you can think of relating to each topic or subtopic. Then, before you begin studying each morning, thoroughly review your notes from the previous day to refresh your memory. Read through all of your notes twice a week. Connect concepts to real-life examples. If you’re learning a new law topic, think of some way that it relates to something you’ve seen before in a book, the news, class, or your everyday life. When visual connections are formed, you’ll be more likely to remember that information long-term. Study alone, as studying with others will easily distract you from your work. Other visual distractions to avoid whenever possible include TV screens, videogames, and social media. Facing away from windows while studying will also help maximize concentration. You learn best through speaking and hearing. You enjoy class lectures and discussions and have noticed that you participate in them more than your peers. Once someone has given you verbal directions to a new place, it’s almost effortless for you to find your way there. You also commonly talk yourself through tasks as you complete them and read e-mails, class handouts, or any other written information out loud, regardless of if anyone is in the room or not. Study with others. Get together with a friend or group to discuss subjects, ask questions and listen to others explain law concepts in their own words. Doing this will allow you to learn by engaging your greatest strengths – talking and listening. If you must study alone, summarize key law concepts and talk yourself through practice questions out loud. Avoid noisy spaces, as they are your biggest study distraction. Whether you’re studying alone or with others, ensure that you are in a quiet environment where limited other conversations are happening around you. Examples of smart study spots include a library, park or your own room. Use mnemonic devices. Because you think in words rather than images, pinpointing key words or creating chants, rhymes or acronyms for specific law topics will help you remember the material better. For example, if you were memorizing the seven subjects on the MBE, you would be more likely to remember CCCCRET on exam day than Civil Procedure, Constitutional Law, Contracts, Criminal Law, Real Property, Evidence, and Torts. You learn best through touching and interacting. You find it difficult to sit still for long periods of time and commonly catch yourself “zoning out” in the classroom. Exercising is more relaxing to you than reading a book, and you are more likely to remember how you felt during an event than specific details about it. Just as well, you use hand gestures during conversations with others and would rather figure something out on your own than read or ask for directions. Keep a distractions list. Your mind tends to wander, making it difficult for you to keep focused on a single task for an extended period of time. To combat this, keep a blank sheet of notebook paper by you to write down any distractions you have as you study. 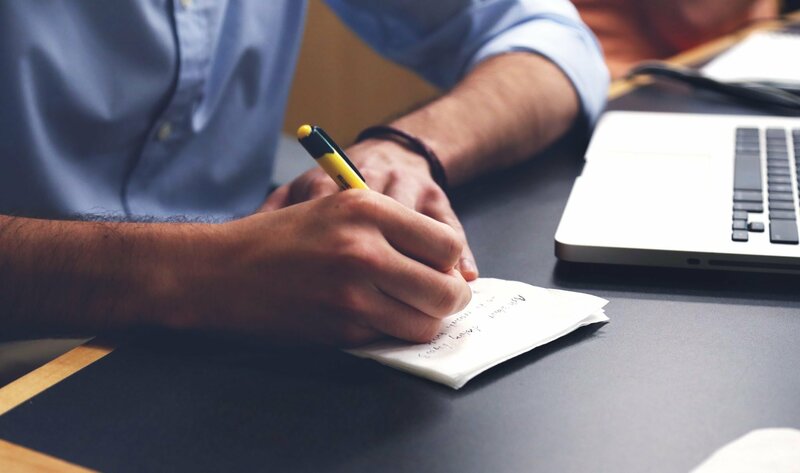 This ensures that as soon as your mind starts drifting from the law to that bill you need to pay or your grocery list, you can write the preoccupation down and rest assured that you won’t forget about it later. Chew gum. Chances are, you won’t be allowed to pace the floor, take a 15-minute break or play with a stress ball during one of your tests, especially when it comes to the State Bar. Chewing gum, however, is seldom prohibited and can help keep your body active and mind focused as you study and take the exam. Vary your study techniques. Limiting yourself to one particular study method – outlines, note-taking, flashcards, studying alone or with others – doesn’t coincide with how your brain operates and is therefore an inefficient use of your time. Instead, mix up your study environment and techniques to keep yourself motivated and interested in the material. For every 50 minutes that you study, give yourself a 10-minute break to refocus. I’m having a hard time finding your sources for the statistics provided. Can you point me in the right direction? Are you referring to the statistics found in the image of “Learning Style Statistic” that shows the learning style of Visual – 65% Auditory – 30% and Kinesthetic – 5%? 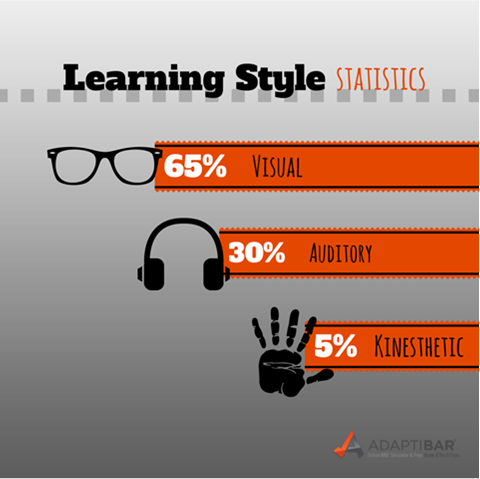 That image is an example of what your learning style statistics could possible look like. It is not an actual breakdown of everyone’s learning style statistics. To find out your learning style statistics, you can follow the link in the blog that takes you to a quick 20 question quiz at educationplanner.org that will give you your very own learning style statistics. Hope this helps and good luck!